Glenys Kennard had a bucket list of horse things she wanted to achieve. She has ticked off just about everything that was possible to have on the list. Not only have Glenys and her husband, Phil, ticked off all the things you could ever wish for in racing, but they have taken so many others along for the wonderful ride in shares with their horses. The Kennards seldom own a horse outright. Every horse they buy at the yearling sales each February gets split amongst friends and colleagues in thirds or quarters. 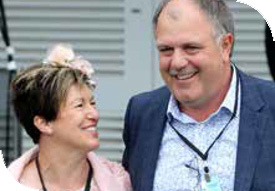 An incredible achievement that the Christchurch couple should own shares in four horses recognised on the night as the winners of their respective age group categories. Lazarus, Smolda (Aged Pacing Horse), Ultimate Machete (3 year old Pacing Colt) and Spankem (2 year old Pacing Colt). During the season, Lazarus had won the $765,000 NZ Cup and Smolda the A$1,000,000 Inter-Dominion Grand Final in Perth, West Australia. The common denominators in the four horses, apart from the Kennards’ share in each ownership, was they were all purchased at the yearling sales and the four are trained from the all-conquering All Stars Stable at Rolleston run by Mark Purdon and Natalie Rasmussen. Phil Kennard is quick to point out that they rely on the judgement of trainers, Mark and Natalie, in their purchases. But he openly admits, it was Glenys who fell in love with Lazarus first (at that time he was named Bettor Than the Best). She had lots of ticks next to him in the sales book. Fifteen individual people shared in the ownership of their four award winners plus members of the Breckon Racing Syndicate that was formed by great friends of the Kennards, Karen and Ken Breckon of Auckland. Over the years, there have been a host of people who have shared in the fun and excitement. PGG Wrightson Standardbred consultant, Peter Lagan has 40 years of credibility behind him in the auctioning of horses. “The success of our yearling sales is very much built on repeat business. “Selecting quality individuals at the sales, giving them to a good trainer and setting the horse on a path with goals has proven a winning formula” says Peter. Every share owner comes with their own story, like Jim and Ann Gibbs of Matamata. Jim is retired but was one of our leading thoroughbred trainers. Or like the Lancasters, a Canterbury rural couple who took the last remaining share that turned out to be Isaiah, who went on to win 13 races and be placed 16 times from only 38 starts for earnings of $589,667. One shareholder needs a special mention: Trevor Casey, owner of Lone Star Riccarton was also named owner of the year himself in the 2014/15 season. Trevor has a huge passion for the straight-out trotter and breeds a number himself. But just like the Kennards and so many others, he loves the involvement and friendships made in shared ownerships. Trevor has also had great success in ownerships with the other Purdon brother, Barry, who trains out of Clevedon. Shared ownership is definitely the greatest change to be experienced in the harness racing ownership model in recent times. The governing body, Harness Racing NZ, now allows up to 10 individuals to be named in the ownership of a horse. Any number from two to 50 may form a syndicate. Undoubtedly, the most prolific syndicate in harness racing would be the Auckland Trotting Club’s “ATC” syndicates. They buy three yearlings at PGG Wrightson sales most years and have had an 85% success rate of winners to starters. It’s an absolutely low-cost investment, usually around $2,000 upfront a share, and $160 a month for training, etc to be in all three. They had the absolute joy of owning the double millionaire pacer, Changeover, who won them 29 races on both sides of the Tasman. Everyone involved in a group or syndicate says the same thing. It’s still an incredibly exciting experience if you only own a hair of the tail or more likely the whisker of the winning nostril. Travelling is the other part of the fun factor, be it inter-island or trans-Tasman, especially with friends. Kiwi-owned horses have a great record in Australia, and because the horses can be flown across, it is just like an extension of our own industry and widens the opportunities to race for very good stakes. Catalogues for the Auckland Sale (12 February) and Christchurch (13 & 14 February) are available in early December. Contact PGG Wrightson Standardbred for expert advice or go to www.standardbred.co.nz.